It’s 1957. A guy holding a newspaper goes into his favorite bar. It’s my Uncle Lando, an ex-boxer in his mid-40s, but still full of vigor and still a performer. As reported to me later, he’s excited about what he found in the paper: a letter by one of his favorite nieces—me. “Hey, guys, my niece is in the paper!” He then proceeds to read my letter, a solid right jab in defense of Elvis against the sucker punch that was landed the week before by Spike Wallace, the Pittsburgh Sun-Telegraph’s music critic. So what began as an outbreak of teen-aged girls’ lust and hysterics, first infecting myself and my best friend Monica as we watched Elvis on TV that famous Sunday night in 1956, now had a public life. I was officially an Elvis Fan (though my Elvis Complimentary Fan Club Membership Card was in my wallet long before this). My printed defense of Elvis would become my first encounter with printer’s ink, something I love now as much as I loved Elvis then. 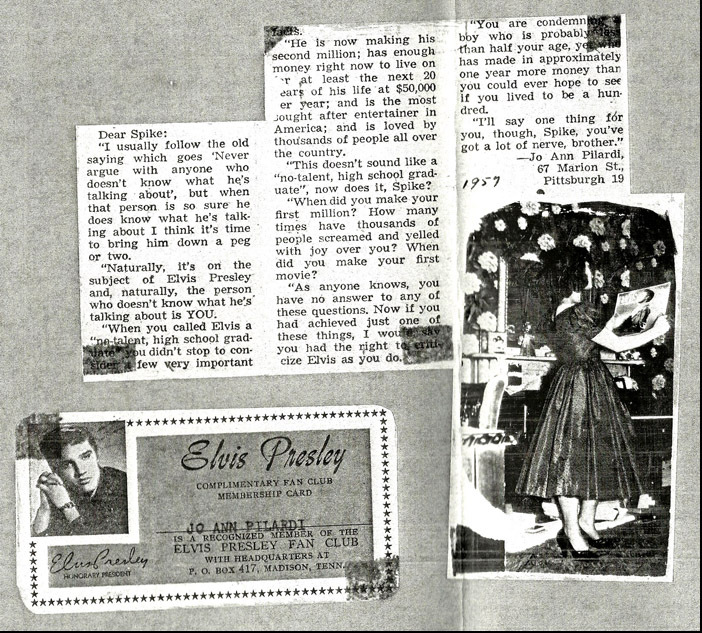 Elvis + Publication: a match made in heaven. Yet an astonishing truth has emerged. 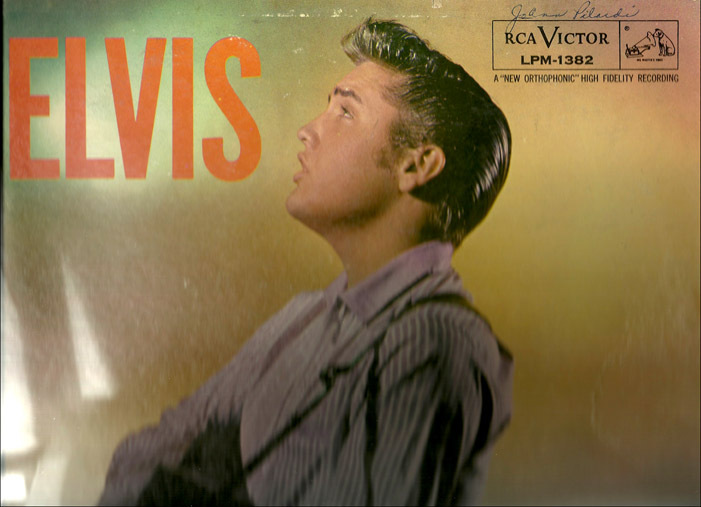 While my own Elvis lust vanished long ago, I’ve encountered another Elvis lust, an odd lusting for my Elvis lust: the passion of my family and friends for my legendary (if now non-existent) Elvis lust. And that has not only survived but thrived. Though I beg them to stop, they persist in depositing gaudy Elvis gifts on my English Tudor doorstep. Herewith an incomplete catalogue of my Elvis gifts: a resin plastic Elvis brooch; a large Elvis neon-blue-light bar clock; Graceland: An Interactive Pop-up Tour (the most remarkable in my extensive collection of Elvis gift books); Elvis birthday cards and note cards; a cartoonist friend’s self-portrait as a guitar-playing Elvis; paper and painted tin posters of Elvis (always with plans of how-to-frame & where-to-hang); The Night of 100 Elvises Live! 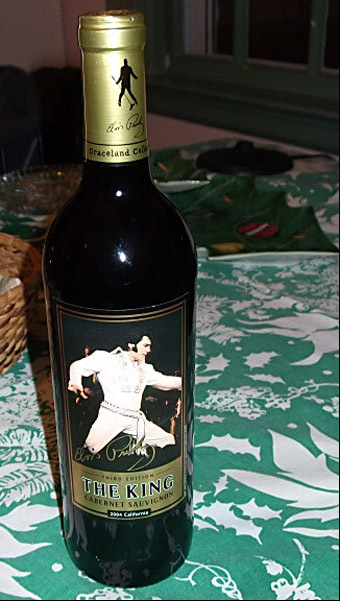 cd; a bottle of “The King” wine; an Elvis clutch bag and an Elvis umbrella; a framed collage of Elvis-related items ingeniously bordered in red glass lozenges to resemble a theater marquee; and of course, that famous “Elvis with Nixon” photo. Someone also gave me expensive tickets for the 100 Elvises concert in Baltimore’s Lithuanian Hall last year—unfortunately held on a night when I had “another engagement.” There’s more, but merciful age does bring a level of forgetfulness. Copyright © 2012 Jo-Ann Pilardi. Jo-Ann Pilardi is retired from Towson University where she taught Philosophy and Women’s Studies for 38 years. 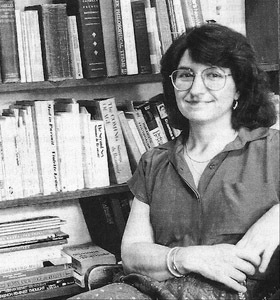 A working class Italian from Pittsburgh, she moved to Baltimore in 1969 and was active in women’s movement groups through the 1970s. Currently, she teaches for TU’s Osher Institute, reads and writes, gardens, travels, and studies jazz piano (with a few segues into old Elvis tunes). This entry was posted on Wednesday, April 4th, 2012 at 7:40 am and is filed under essays, family, history, media, music, non-fiction, relationships, theater, writing. You can follow any responses to this entry through the RSS 2.0 feed. You can leave a response, or trackback from your own site. Love this–great post! Families love easy, themed, go-to gifts. Everyone gets me plaid things–duct tape, notebooks, clothes–and everyone gives my mother anything that is either a) purple; or b) has a heart decoration on it. Admittedly, we both enjoy and encourage these sorts of gifts. Hope your family takes the hint . . . though I’m sure they won’t let it die hard. It would be so fun to get a million little Elvis things to stuff your Christmas stocking every year! What a lovely and funny and poignant essay, Jo-Ann. I thoroughly enjoyed reading it. Does this mean that I’ll have to keep or find another recipient for the “blue suede shoes” xmas ornament I bought for you a couple of years ago and have subsequently misplaced? This is so true and it’s because of the plethora of oh so many tacky Elvis items out there. It’s exhilarating to be able to buy one and think “This’ll be perfect for Jo-Ann” I’ll try to stop, but sometimes the temptation is just too great. Now that the Elvis gift train may stop, I’m finding myself very sad indeed. . . . A friend just told me he visited Graceland and was surprised that Elvis didn’t have such good taste (he was surprised?! ), so I guess the tacky Elvis items truly reflect Elvis. Jo-Ann, loved the story. Hope you are good. I have been scanning all my pictures and you are in a few. I can e-mail them if you would like. I’m good — and happy to hear from you. Nice to know you liked my little piece about The King. I’d love to see the pix. Hope you, the adorable Miss AJ, and all the others are fine. Your article was great, although now that we all know how you presently feel about Elvis, what gift is appropriate when an occasion comes up? I can only surmise Jon Hamm has taken the Kings place. Now will it be stuff to remind you of your new love, to surround yourself with in every room of your house? I loved the old photo of you. It’s hard to remember wearing those dresses with all those petticoats, but it was a good look. Your newspaper article was pretty feisty stuff, too. I guess you were getting warmed up for the many feminist issues that were heading your way. Hey Jo-Ann, enjoyed the piece on Elvis.I remember the old news clips hanging in your powder room. Glad to see you are doing well. “My father was working for the Coca-Cola Company in New York City at the time both Eddie Fisher, whose show was sponsored by Coke, and Elvis appeared on the scene. Eddie was approved by my parents but not Elvis. I did allow myself to be bribed with free tickets to the Coke-sponsored E.F. TV show. However, one day, when I was walking home from school, I tried to imitate Elvis. I dislocated my knee cap and was carted off to the nearest emergency room. Later that day, I saw ‘that look’ on my mother’s face.